Every time you step out of home to get to work, go shopping, go on a drive or even a short walk, there are some things that you need to be careful about before you leave. 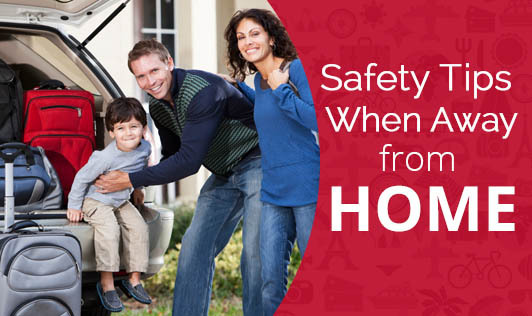 It's not just the safety of your home when you leave that matters. You have to be safe too! 1.Switch off electrical appliances and the LPG gas cylinder before your step out. If left unattended to, it may turn out to be dangerous. Also, turning off electric appliances that are not in use will help saving electricity. 2.Remove your spare key and give it to the most trusted person you know. Also, when you are off for a vacation, safe-guard your jewellery in a bank locker or leave it with the most trusted person. 3.Close your curtains, so nobody can look inside. Arrange things in the center, so it cannot be reached easily from windows and doors. 4.If you are not taking the car, leave a spare car key with someone you know. If you don't park in a garage, purchase a safety device to lock your steering wheel while you are away. 5.Arrange for pet care when you leave home. Sometimes, animals are more comfortable in their home environment, than at a kennel or someone else's home. 6.Empty your garbage cans and clean out perishables from your refrigerator. You don't want to come home to rotten smells. 7.Carry your debit and credit card with you. Make sure you carry important documents with you at all times. Your driver's license or any other identification card with you. 8.Do not let everybody on social networking sites know about the places you are in and when you would reach home. You never know what consequences this may have! 9.Carry a first aid box with you and check before you are leaving if all the first aid tools are present in it and you haven't missed out on anything. Take care. Your life is precious.